In Conquest Mode, attack and establish control over key fortified areas, while defending territories captured from your enemies. Controlling territories gives your team a specific number of influence points if held amounts of time, and the team that gains the necessary influence first wins! Conquest completely replaces the prior “Superiority” game mode. No Changes will be made to your accounts after the update release. Player statistics will move to a separate archive tab in your player Profile, and will begin to accumulate again after the update . Territories of different types provide additional advantages to the controlling team: airfields allow players to repair their aircraft and choose a respawn point, manufacturing facilities increase the number of influence points earned, while command centers and military installations attack the enemy territories and make it easier to capture new territories. To take control of a territory, players need to destroy aerial and ground targets within it; to defend a territory, players need to oppose an enemy attack and prevent a breakthrough. Influence points add to a team’s score usually once every five seconds, but depend on the number and type of territories each team controls. If one team controls all the sectors on the map, a superiority state begins, where the team’s influence accumulates significantly faster. The least complex and defended territory. Provides 3 influence points every 5 seconds. – Decreases respawn timer by 10 sec. Provides 3 influence points every 5 sec. Conducts a rocket strike on an adjacent neutral or enemy territory every 20 seconds until it is captured. After that, it targets the next available territory. Orders an Attack Flight of five bombers to attack an enemy territory (not neutral territories) every 110 sec. The Attack Flight approaches from outside the area of operation, heads towards the targeted territory and bombs it, dealing significant damage. The Flight can be intercepted and destroyed by the enemy aircraft. After the territory is captured, the Command Center targets the next available territory. How Do I Capture Territories? At the beginning of each battle, all key territories are neutral, controlled by their local defense forces. Your team must establish control over the territory by destroying targets within it like ground objects, air defense aircraft and enemy team planes to earn capture points. You need to earn 140 capture points faster than the enemy team for a neutral territory, and 160 to capture the territory from your enemies. Small ground objects = 15-20 pts. Medium ground objects = 20-50 pts. Large ground objects: 50-80 pts. Air defense aircraft: 40 pts. The composition of a defense system depends on the territory type. For example, airfields have virtually no AA artillery, while military installations are heavily fortified. Each aircraft class is more efficient at attacking different territories due to their ability to destroy specific targets and counter local defenses. 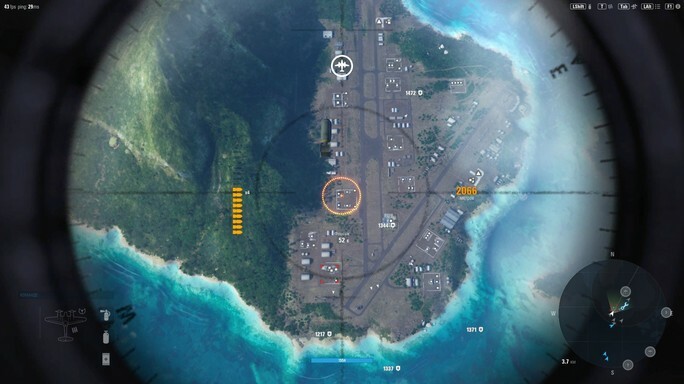 Every kind of airfield serves as a respawn point once your team captures it. When they have more than one, you can choose a preferred target area for your next respawn in the tactical screen while you wait for your next aircraft to be ready. To select a respawn point, left-click the dashed circle around the territory icon in the tactical screen. The minimum respawn delay is 10 sec., with every subsequent destruction of your aircraft increasing the timer by 15 sec. Every airbase your team controls decreases their respawn timer by 10 sec. down to the minimum delay. Seven minutes after a battle starts, a “Thunderstorm” event begins, rendering respawning impossible and meaning the two teams must fight until one reaches the required amount of influence points, or one team loses all their aircraft. 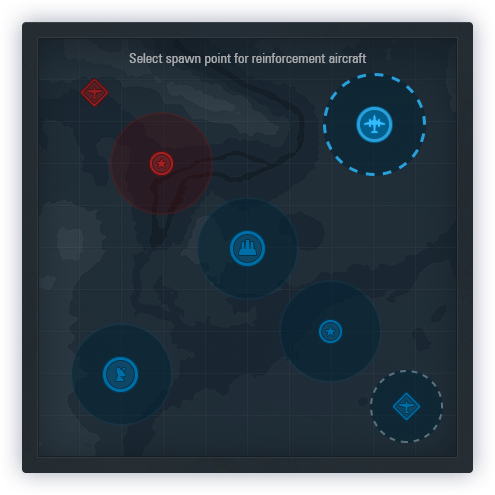 Airfields (Forward Airstrips, Staging Airfields and Airbases) may contain a special object that can repair allied aircraft, marked on the minimap with a wrench icon inside a circle, showing where the repair is effective. Like the Partial Repair, Field Repair starts once your damaged aircraft safely enters the area and you’re not taking damage and sufficiently far from enemies. It’s much faster than the partial repair, and fully restores the aircraft and removes Crew injuries. Once you’ve dropped all your bombs or released all rockets on your aircraft, a replenishment timer for outboard weapons starts, with all outboard weapons replenished when the timer ends. The replenishment time depends on the aircraft type, number of weapons and their power. 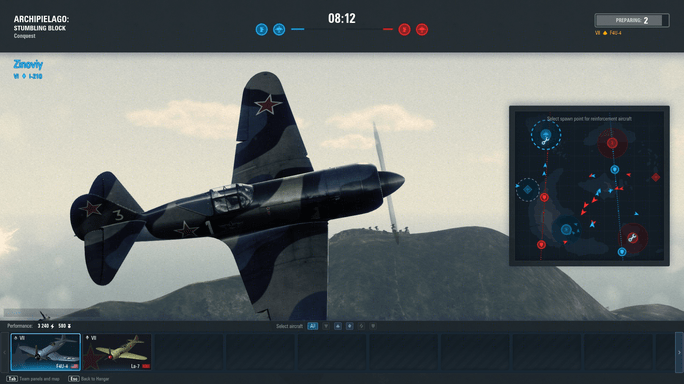 This allows aircraft of different types to adjust their gameplay and attack enemy ground targets several times. 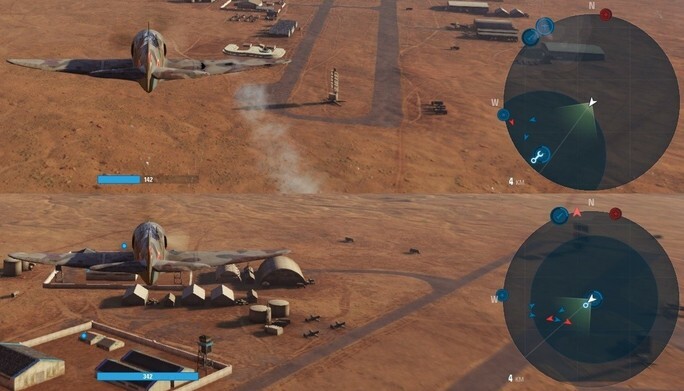 If your aircraft is destroyed, the replenishment timer is not reset: when respawning with the same aircraft model, bombs and rockets will be replenished only after the countdown ends. 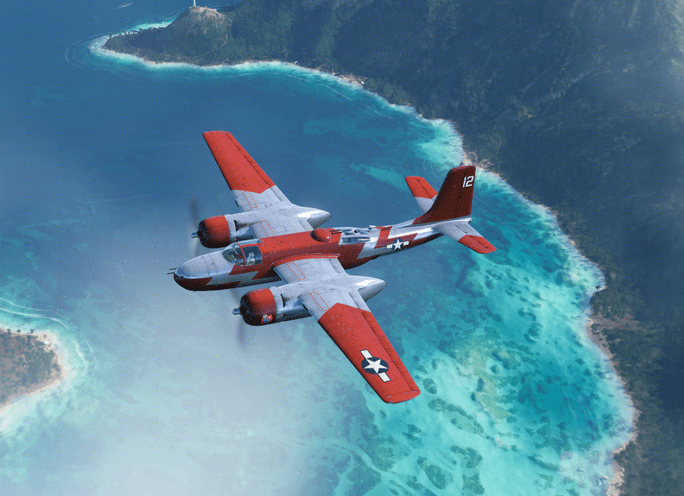 Take flight in a mighty new class of bomber aircraft! These high-altitude heavy hitters have tons of HP, long boosts, and big bomb loads. Suggested bomber tactics include gaining altitude, choosing ground targets with care, and hitting them with precision. The bomb load gradually replenishes after a bomb drops, and coupled with the long boost and high altitude ceiling, you can freely roam the area in relative safety and still influence the battle. Drop bombs a few at a time by pressing the space bar. For more accurate bombing, activate a special Bombsight mode with your left Shift key and you’ll be looking down on a target through targeting optics. The bombsight mode provides for more precise bombing and quick target acquisition. Bombers and attack aircraft also have the new manual turret control feature. Press the “T” key to control the turret — if manually controlled, the turret deals more damage, and you can single out the most dangerous/damaged enemies at your discretion. As bombers operate best at high altitude, we don’t recommend getting too near the ground – this makes the bombers’ main drawbacks of low maneuverability and a weak forward-facing armament tha tmuch more apparent, and you become easier prey. 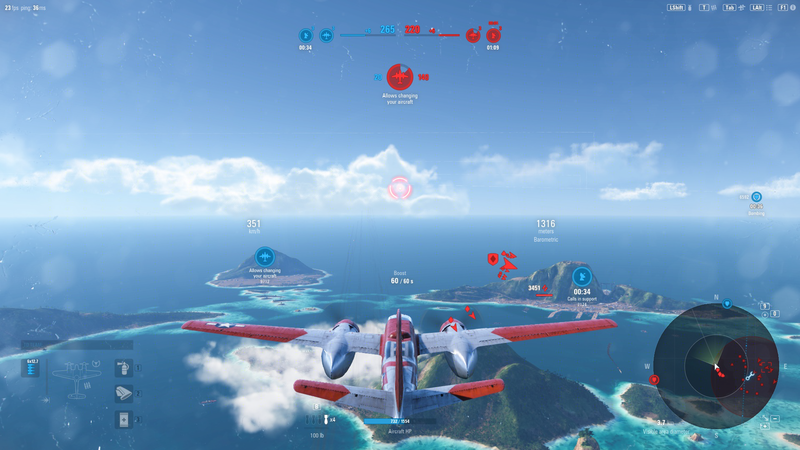 We’ve adjusted the general balance of classes and individual aircraft parameters for Conquest mode, and emphasized the key features of each class to make them especially effective at their roles. We changed some game mechanics that define dependencies between an aircraft’s flight characteristics and flight altitude, in order to provide easier control over your aircraft in any situation. You can now have maximum maneuverability at any altitude between ground level and your aircraft’s optimum altitude. Exceeding optimum altitude means a noticeable decrease in flight characteristics, while approaching the altitude ceiling decreases them further, making them sufficient only for level flight. Find the full list of key bindings in the “Settings” menu. Similarly, maneuverability depends on flight speed: when approaching critical values, a risk of stalling or losing control appears, when exceeding the optimum airspeed (in case of diving), maneuverability is significantly reduced. 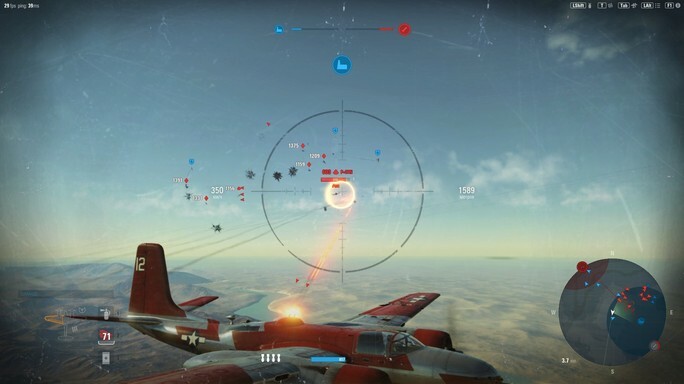 Aircraft now move freely to the sides of the screen when maneuvering, picking and tracking targets, and aiming in dogfights. This should make all these actions significantly easier. The camera moves back from the aircraft when accelerating to provide a greater field of view. We also added a large number of visual effects to improve the flight experience. This public test of Conquest features a new approach to shooting forward-facing weapons: we removed the lead-compensating aim point. We believe that you should concentrate on firing at the enemy rather than tracking an onscreen icon. In order to shoot accurately, you’ll need to keep track of enemy aircraft constantly, react to their maneuvers, and pick an approach trajectory and lead the target correctly; as you constantly adjust your aim based on tracers and hit marks. Since projectiles have certain speeds, the lead compensation mechanics are still present. Correct your aim to accurately hit a target as you consider its distance, direction and flight speed, to ensure the target and projectile intersect. Each weapon has a different effective range depending its caliber and type. You’ll see a counter showing the distance to your target, which turns red once on approach to the weapon’s effective firing range, telling you when you can hit the target effectively. In all cases except head-on approaches or shooting from directly behind a target, the optimum aiming point is located slightly ahead of an enemy aircraft. We made tracers and hit marks more distinctive to show where you’re shooting, and if you hit on connecting with an enemy’s flight path. Standard evasive maneuvers are still effective to avoid damage, but you must dodge immediately after taking fire. An improved damage system allows you to target specific aircraft sections. Damage caused by forward-firing armament varies from minimum if fired at the maximum range to the target, to maximum, if fired in close combat. Apart from losing HP due to hits, an aircraft can also catch fire or sustain critical damage to certain modules: wings, tail, fuselage, and engine. Critical damage reduces aircraft performance dramatically: damage to the tail assembly and fuselage reduces maneuverability, damage to the engine—thrust, airspeed, and boost efficiency. Besides this, enemy fire can injure the crew. An injured pilot is not capable of firing accurately and an injured rear gunner stops firing the rear gun. It’s now easier to deal critical damage to a crucial aircraft module, and is most effective when shooting large, durable aircraft like bombers and attack aircraft. Conquest mode has Mastery and Combat points to calculate your efficiency and compensation after battles. The number of Mastery points earned in a battle directly affects the amount of experience that aircraft and Crews earn after battle. If you use several aircraft in one battle, the experience goes to all of them, and their Crews, based on the number of Mastery points earned while piloting each of them. 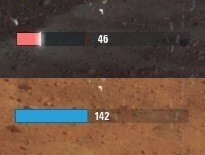 The number of Combat points earned in battle directly affects the amount of Credits you earn. Victory awards additional Credits. The cost of aircraft repairs depends on the number of times the craft was destroyed in battle. Preserving your aircraft and repairing it over the allied airfields allows you to reduce expenses significantly. If you use several different aircraft in a battle, their repair expenses are calculated separately. As before, the Gold or Credit payment for using ammunition and consumables is deducted after their first use in battle, with the first weapon fired, bomb dropped, rocket launched, or consumable used. Your ability to respawn and re-enter battle does not affect expenses — they’re only deducted once per battle. Considering the outboard armament is gradually replenished in Conquest, the first bomb dropped or rocket launched now costs the amount of the full load of that weapon type. If you use several different aircraft in a battle, the expenses for ammo and consumables are cumulative. We reworked the heads-up display (HUD) in battle to be lighter and less obtrusive, prioritizing control of the aircraft in combat rather than elements of the HUD. In the center of the screen, under the influence meter, there is an icon for the territory where a player’s aircraft is currently flying and the status of the territory. We completely redesigned the minimap and integrated it with the radar, combining both orientation elements (cardinal directions, icons showing directions to key territories) and tactical information (objects, enemy and allied aircraft around you). The minimap size can be changed with the + and – keys, and the display scale with the 9 and 0 keys. The minimap zoomed all the way out helps to evaluate the situation in the operation area and the states of the key territories, as well as understand the flight directions of allies and enemies. 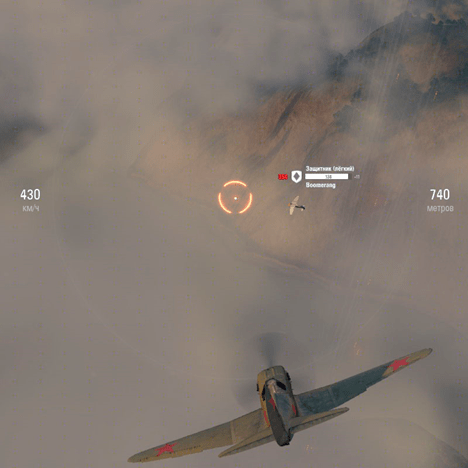 When zoomed all the way in, the minimap can be used as a radar to evaluate the situation immediately around the player’s aircraft. In the bottom left, there is an aircraft layout showing whether there is critical damage to aircraft modules, how ready the mounted consumables are for use, and how overheated the forward-firing armament is. Besides this, the state of an aircraft can be quickly evaluated by the following graphic effects: smoke and sparks indicating damage, screen darkening, oily traces indicating critical damage, etc. We’ve added several visual effects to indicate when your plane sustains critical and severe damage. The screen now shows the current state of your plane without needing to always peek at your HP meter. When holding “Tab,” a panel with the battle information is displayed. 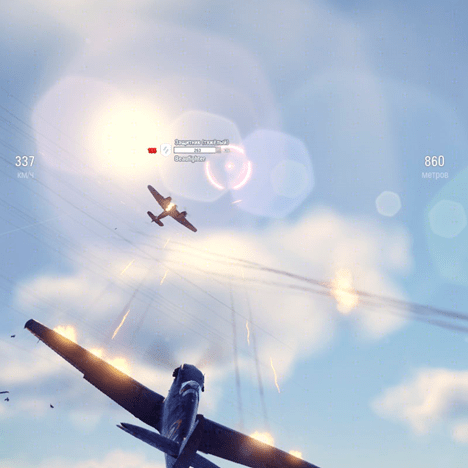 The information includes team players’ performance, a tactical map of the operation area, information about aircraft type-specific missions for the aircraft the player is flying, and the progress of the mission. When your aircraft is destroyed, the camera now switches to the enemy aircraft that shot it down, giving you a better idea of how you got hit. We also changed the cinematic “observer” camera mode — it now uses more dynamic movie-like camera angles and effects. If your team controls the airbase and the “squall line” gameplay event has not started yet, at the bottom of screen in the Spectator mode, you can select an aircraft from those available and suitable for returning to battle.